Nobody knows what art is; everybody knows art can be anything. In 1998, artist Tracey Emin famously submitted her unmade bed to the Tate Gallery in London. She wasn’t planning a sleepover at the museum; rather, she was exhibiting her newest artwork, My Bed. In 1999 that same unmade bed (plus scattered miscellany like slippers, underwear, empty liquor bottles, a stuffed animal) was shortlisted for that year’s Turner Prize, the annual award given by the Tate to honor exceptional British artists under 50. Also in 1999, Chinese performance artists Cai Yuan and Jian Jun Xi debuted their latest piece: Two Naked Men Jump Into Tracey’s Bed. Yes, it’s pretty much how it sounds: they stripped down (though apparently not completely), jumped onto Ms. Emin’s My Bed, and had a pillow fight for about a quarter of an hour until being escorted out of the museum (to applause, natch). According to Wikipedia, Messieurs Cai and Jian felt that Ms. Emin’s version “had not gone far enough.” But if they had any wit they would have made the bed and bounced a quarter on it. So, is My Bed art? And to those who’d say that it is, what about Two Naked Men Jump Into Tracey’s Bed? Was that art too? And did that performance have any affect on the original? That is to say, is My Bed the same piece of art it was before that fated pillow fight and its further rumpled sheets? For anyone who answered that a disheveled bed is most decidedly Not Art, see if this sways your opinion at all: My Bed was back in the news last month when an anonymous buyer purchased it at a Christie’s auction for $4,351,969. And its prior owner was collector and advertising visionary Charles Saatchi, who had earlier dedicated a room in his house to it. Does a famous museum’s acceptance of a piece, or the art world’s approving estimation of it, automatically ensure that it is art? If the museum had rejected My Bed and Tracey Emin had become a laughingstock in society’s rarefied, already somewhat ridiculous art circles, would My Bed not have been art after all? What if opinion had been divided? And be honest: did that $4 mil price tag affect your own perception of My Bed? These questions must precede any debates about mere aesthetics (the growing scientific approach to which was touched upon on this very blog, here). We’re talking about the proverbial view from 35,000 feet here: What the hell is art? And how about we consider a third red square, the one featured as part of the standard storm advisories issued by the national weather service? I couldn’t find the piece titled Number 34 at MoMA. 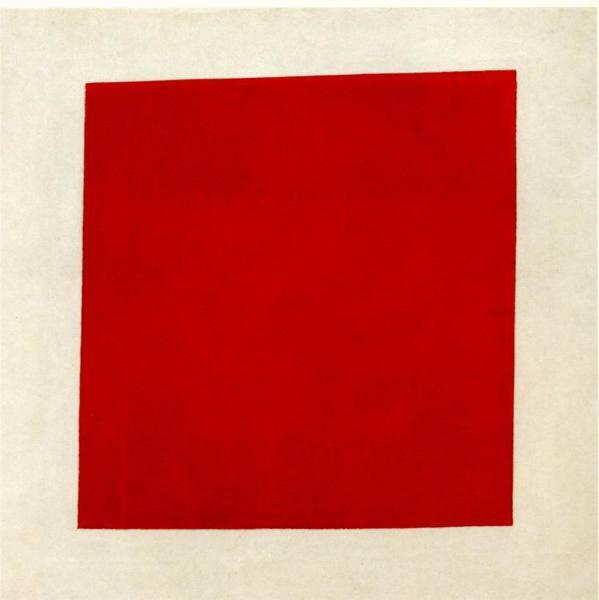 But I found this painting: Red Square (1915) by Kazimir Malevich. The editors suggest that the crucial differences of these similar-looking red squares do not lie in their aesthetics but in their “semantic structures.” The first red square has no context whatsoever and signifies nothing, while Number 34 is an “heir” to the work of groundbreaking abstract artists who came before it — a contribution to a continuous conversation extending back through history, from movement to movement, from Suprametism as a narrow branch of Abstract Expressionism and back further to everything leading up to those two developments that made them imaginable in the first place. And our weather service’s red square does signify something — that a storm is coming — but contributes nothing to that conversation. And so, while they’re all aesthetically similar, MoMA paid $1 million to acquire only one of them. Of course, Number 34 was painted. A person dreamt it up and uniquely created it. And even Tracey Emin had to — make? — her unmade bed by sleeping in it. I painstakingly crafted this exquisite original red square in five grueling minutes. I’ll call it... Number 35. Maybe it’s a subtle critique of “Blurred Lines.” Maybe it’s not. Maybe it’s art. Maybe it’s not. So, what about the Found Object school of art? For about a century people have been claiming everyday items as art, sometimes enraging people in the process (and sometimes on purpose). 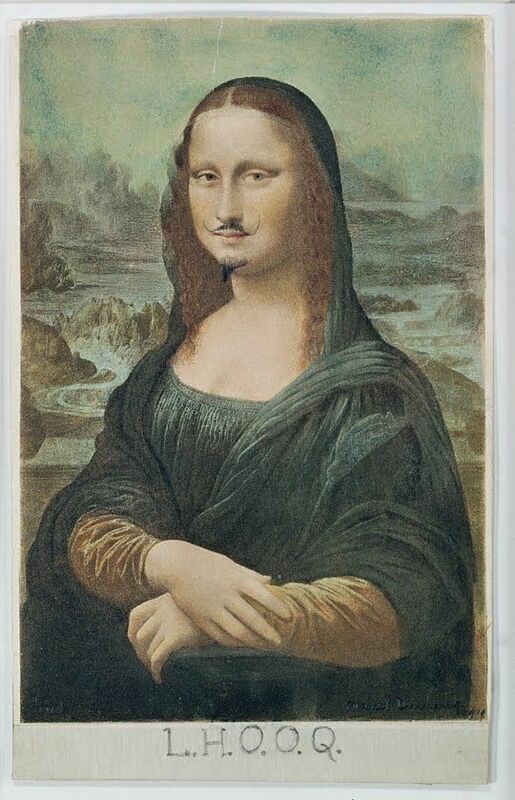 The master of found art was Marcel Duchamp. The New Criterion editorial talks about him too. One day he picked up a bottle rack and decided to call it art. One of his best known “readymades” is a bicycle wheel. 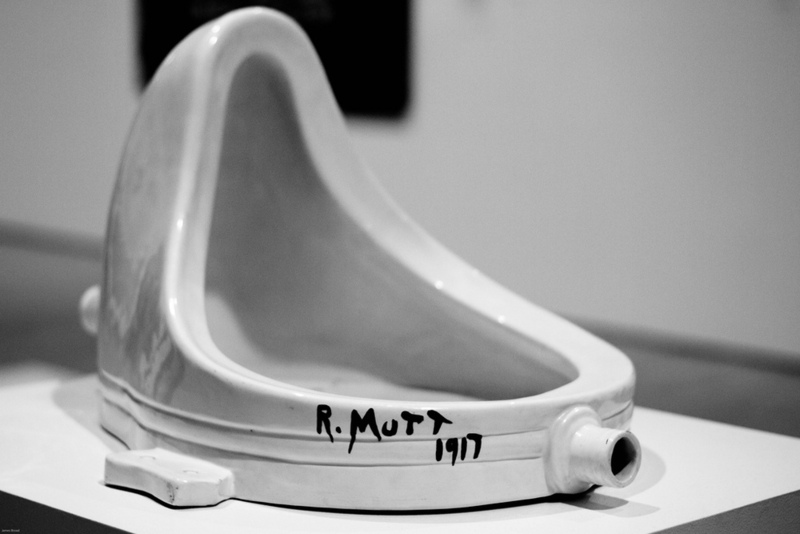 But the most famous of all his readymades is of course Fountain, a found sculpture he altered only by signing it “R. Mutt 1917.” Fountain is a urinal. You may have heard of it, but did you know it was first unveiled in 1917? That’s probably common knowledge to artistic people but I would have guessed its provenance to be in the 1960s. So yeah, a urinal. Say what you will, but Duchamp was certainly ahead of his time. Ten years ago, Fountain was named (by 500 “experts”!) the most influential work of art of all time. If that seems absurd, remember that “influential” is a value-neutral term and that today’s art world has given us far more shocking contributions, all of which can be traced convincingly to Duchamp. The notorious Fountain by Marcel Duchamp. Image courtesy of Flickr user James Broad. I think he’d hate for anyone to say so, but his abandoning of art for chess seems to me a more impressive piece of performance art than Two Naked Men Jump Into Tracey’s Bed. It’s not even close really. And he wasn’t even truly trying to make art! The half-naked bed-jumpers would likely disagree. It is all pretty subjective. But they were trying too hard. Duchamp threw his hands up and changed the course of art forever. Nowadays something has eclipsed found art; let’s call it Placed Art. Mostly this covers street art and sophisticated graffiti, but it’s extended to artists surreptitiously hanging their own work in museums. He’s not the only one, but Banksy has been remarkably successful at this (although the museums tend to take these pieces down immediately). There are those who vehemently object to what he does and refuse to recognize it as art at all, but it’s not too difficult to trace a line from Banksy back to Warhol and Duchamp himself. Questions of what art is are not confined to visual art. Is John Cage’s composition 4′33″ music, conceptual art, both, or neither? It’s four minutes and thirty-three seconds of silence. You can buy it on iTunes. Here is the score. Comedy has similar debates. People still argue about Andy Kaufman. Was his live reading of The Great Gatsby funny? Was it comedy? Anti-comedy? How about his dramatic wrestling matches? Not everyone agrees. What about Robin Williams pretending to be John Houseman reading the phone book? Is it art? Is it a provocation? Is the artist daring us to reject the mini-fridge’s artistic bona fides, tricking us into claiming that he’s a poseur, opening us up to charges of bourgeoisie closedmindedness, of not getting it? But then the writer walks around the case and discovers the opposite side of the exhibit, where it’s revealed that the piece isn’t a real mini-fridge at all. The artist constructed it from scratch and painted it to look real (hence the “acrylic, bondo, canvas” details in the label). I sympathize 100% with the writer’s reaction. He first encountered the piece displayed in a museum and thought, OK, well I guess this can be art — I’m in a museum after all. That reasoning is logically fallacious (the fallacy of the appeal to authority), but it’s an honest reaction. You’re in a museum. You expect to see art. The frame is set, the context implicit. I also shared his response when he found out the fridge was a fake: The fact that Mr. Oshiro meticulously fabricated it makes the art artier. It just does. Doesn’t it? But wait, didn’t I already concede that I might have considered a real mini-fridge in a museum to be a work of art? I guess I did. And how many bases did I just steal with that “artier” back there? You got me. Well now friends, I don’t know what else to say except that we should probably be rummaging through our closets for our big debuts at the Tate. It’s 2014. Art is antithesis. Art is apophasis. Art is attitude. Art is that thing over there.